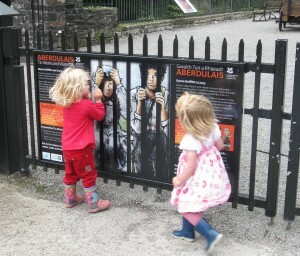 The little one got an explorer pack and she loved going round with her magnifying glass and taking rubbings on the plaques provided. I enjoyed the aroma pots that were included and helped bring history to another level! Brilliant! A secluded gorge with a powerful waterfall that has attracted a range of industries dating back to the 16th century. 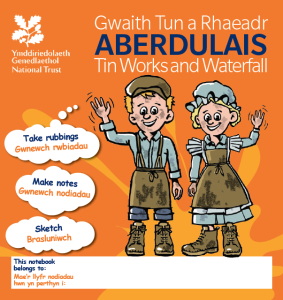 The remains of a pioneering tin-plate works are still present to explore and the waterfall still draws people to admire it’s raw power and beauty. 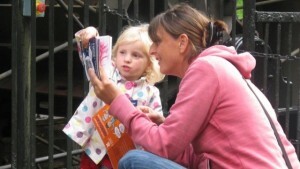 To improve the appeal of the site for family visitors. 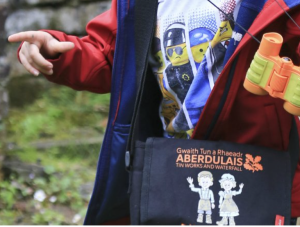 Creative project development – Research into social and industrial heritage – Budget and programme management – Copy writing – Concept designs – Commissioning, briefing and managing illustrator, sculptors, designer, fabricator, welsh translator, production of panels, printing of leaflet and materials for family pack – Sourcing sundry supplies for the family pack – Facilitating staff – Reporting to European Funding administrators – Coordination of design and production of all outcomes. 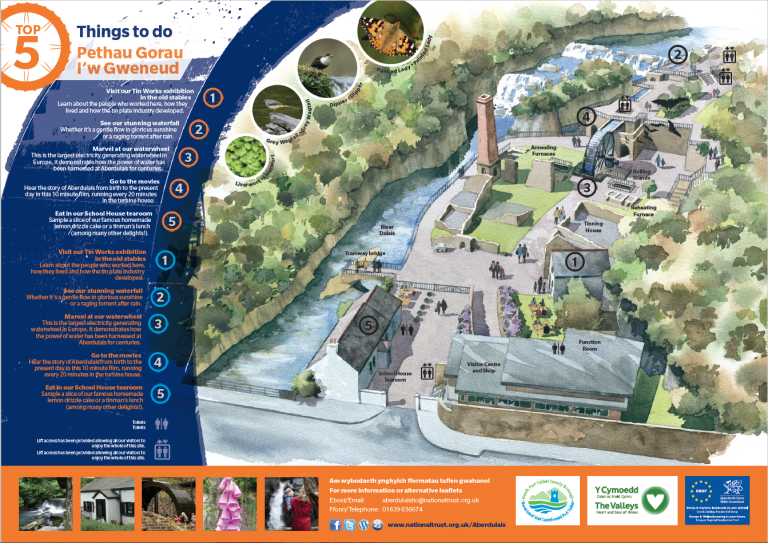 Extract from the new visitor leaflet with birds eye illustration of the site. 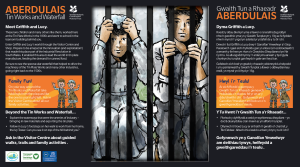 Facing out from the site, this panel was designed to be intriguing from a distance – giving the impression of the Victorian child tin-workers peering through the bars of the gate. 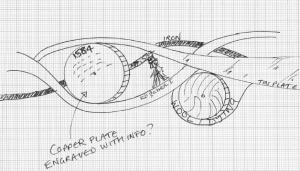 Following my development of concepts I approached and briefed suitable sculptors to present their own interpretation of a timeline for this site. 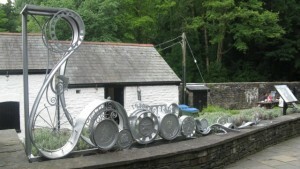 From there and in conjunction with the client, a sculptor was selected to produce and install the feature on-site. A set of 10 acrylic rubbing plaques with images that tally with the detective cards. The fixings for the plaques were fabricated to fit to existing site furniture in order to keep clutter to a minimum. 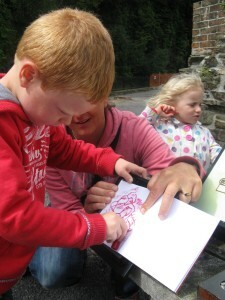 A booklet for children to make their rubbings in providing them with a pictorial story of the site to take away. 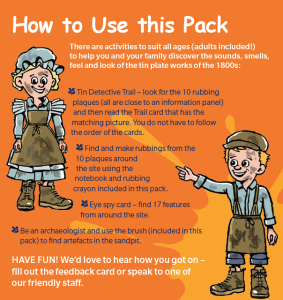 Rubbing plaque and booklet in use. 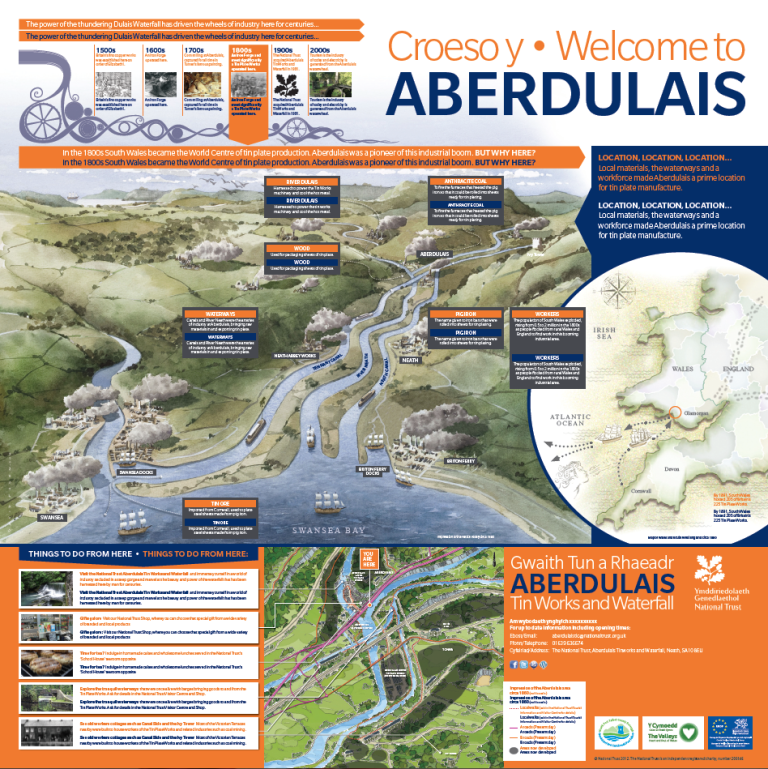 A predominantly pictorial welcome sign giving the context of the site and providing information of interest to locals and visitors alike.